This section of the site contains information about the structure of the Dena'ina language. The sounds page describes the Dena'ina sound system. Dena'ina contains a number of sounds which are not found in English. These include the so-called barred-l or voiceless-l (written ł); the back-velar or uvular sounds produced at the back of the mouth; and the "glottalized" or "ejective" sounds produced with a slight popping noise (written t', ts', tl', ch', k', q'). An example which contains all of these types of sounds is the word for 'fish'. An audio clip pronounced by Mrs. Gladys Evanoff is given below. The first sound in the word is the barred-l ł. The sound represented by q' is a glottalized sound produced at the back of the mouth. The Dena'ina writing system is described on the literacy page. The Dena'ina alphabet includes at least one symbol not found in English (namely, the barred-l ł). In addition, the Dena'ina alphabet uses many of the same symbols found in the English alphabet but assigns a different pronunciation to them. Dena'ina is spoken in several different regional varieties, the main ones being Inland, Upper Inlet, Outer Inlet and Iliamna. The dialects page describes the differences between the major Dena'ina dialects. Different dialects often have slightly different pronunciations. For example, the word 'water' may be pronounced minłni, vinłni, or binłni, depending on dialect. The grammar of Dena'ina is described on the grammar page. All languages have grammar. That is, all languages have certain rules which must be followed in order for the language to make sense. It is important to recognize that the rules of Dena'ina grammar are for the most part very different than the rules of English grammar. When we speak of "rules" of grammar we mean something very different from schoolbook grammar rules such as "don't say ain't" or "don't end a sentence with a preposition". Rather, these rules are required in order for the language to make sense. One of the biggest differences between English and Dena'ina is the way in which words are put together. In Dena'ina, a single word can convey the equivalent of an entire sentence in English. Understanding word structure is an important part of understanding Dena'ina grammar. For example, the English sentence I will see you again translates into Dena'ina as a single word. 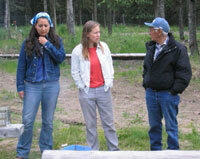 Dena'ina is one of roughly 40 languages of the Athabascan family. Eleven of these, including Dena'ina, are spoken in Alaska. These languages are closely related to each other and share many similarities in pronunciation and grammatical structure. Athabascan languages are spoken throughout interior Alaska and Western Canada, as well as in the desert Southwest and Pacific Coast of the United States. The Athabascan family is one of the largest language families in North America. See the language relationships page for more information.